^ "Thirty Years' War: Battle of Breitenfeld". historynet.com. 2006-06-12. Retrieved 24 May 2008. ^ Böhme, Klaus-R (2001). "Die sicherheitspolitische Lage Schwedens nach dem Westfälischen Frieden". In Hacker, Hans-Joachim. Der Westfälische Frieden von 1648: Wende in der Geschichte des Ostseeraums (in German). Kovač. p. 35. ISBN 978-3-8300-0500-1. ^ . "Catalonia, Revolt of (1640–1652) - Dictionary definition of Catalonia, Revolt of (1640–1652) | Encyclopedia.com: FREE online dictionary". www.encyclopedia.com. Retrieved 2017-11-04. ^ Outram, Quentin (2001). "The socio-economic relations of warfare and the military mortality crises of the Thirty Years' War". Medical History. 45 (2): 151–184. doi:10.1017/S0025727300067703 (inactive 2019-01-09). PMC 1044352. PMID 11373858. Åberg, A. (1973). "The Swedish army from Lützen to Narva". In Roberts, M. Sweden's Age of Greatness, 1632–1718. London: St. Martin's Press. Polisensky, Joseph (2001). "A Note on Scottish Soldiers in the Bohemian War, 1619–1622". In Murdoch, Steve. Scotland and the Thirty Years' war, 1618–1648. Leiden: Brill. pp. 109–115. 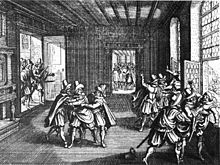 "The 30 Years' War (1618-48) and the Second Defenestration of Prague - Professor Peter Wilson". Gresham College. 2018-05-24. The Battle of Nördlingen was fought in 1634 during the Thirty Years' War, on 27 August or 6 September. The Roman Catholic Imperial army, bolstered by 15,000 Spanish soldiers, won a crushing victory over the combined Protestant armies of Sweden and their German-Protestant allies. Ferdinand I was Holy Roman Emperor from 1558, king of Bohemia and Hungary from 1526, and king of Croatia from 1527 until his death in 1564. Before his accession, he ruled the Austrian hereditary lands of the Habsburgs in the name of his elder brother, Charles V, Holy Roman Emperor. Also, he often served as Charles' representative in Germany and developed encouraging relationships with German princes. Ferdinand II, a member of the House of Habsburg, was Holy Roman Emperor (1619–1637), King of Bohemia, and King of Hungary (1618–1637). He was the son of Archduke Charles II of Inner Austria, and Maria of Bavaria. In 1590, his parents, who were devout Catholics, sent him to study at the Jesuits' college in Ingolstadt, because they wanted to isolate him from the Lutheran nobles. In the same year, he inherited Inner Austria—Styria, Carinthia, Carniola and smaller provinces—from his father. Rudolf II, Holy Roman Emperor, who was the head of the Habsburg family, appointed regents to administer Inner Austria on behalf of the minor Ferdinand. Ferdinand III was Holy Roman Emperor from 15 February 1637 until his death, as well as King of Hungary and Croatia, King of Bohemia and Archduke of Austria. The Battle of White Mountain was an important battle in the early stages of the Thirty Years' War. Frederick V was the Elector Palatine of the Rhine in the Holy Roman Empire from 1610 to 1623, and reigned as King of Bohemia from 1619 to 1620. He was forced to abdicate both roles, and the brevity of his reign in Bohemia earned him the derisive nickname of "the Winter King". Albrecht Wenzel Eusebius von Wallenstein, also von Waldstein, was a Bohemian military leader and nobleman who gained prominence during the Thirty Years' War (1618–1648), in the Catholic side. His outstanding martial career made him one of the most influential men in the Holy Roman Empire by the time of his death. Wallenstein became the supreme commander of the armies of the Habsburg Emperor Ferdinand II and was a major figure of the Thirty Years' War. 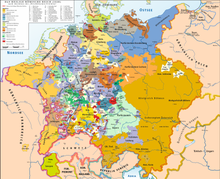 The Catholic League was a coalition of Catholic states of the Holy Roman Empire formed 10 July 1609. While initially formed as a confederation to act politically to negotiate issues vis-à-vis the Protestant Union, modelled on the more intransigent ultra-Catholic French Catholic League (1576), it was subsequently concluded as a military alliance "for the defence of the Catholic religion and peace within the Empire". Maximilian I, occasionally called "the Great", a member of the House of Wittelsbach, ruled as Duke of Bavaria from 1597. His reign was marked by the Thirty Years' War during which he obtained the title of a Prince-elector of the Holy Roman Empire at the 1623 Diet of Regensburg. The Edict of Restitution, passed eleven years into the Thirty Years' War on March 6, 1629 following Catholic successes at arms, was a belated attempt by Ferdinand II, Holy Roman Emperor to restore the religious and territorial situations reached in the Peace of Augsburg (1555), whose "Ecclesiastical Reservation" had impeded the secularization of Catholic church lands after 1555, as no further Catholic church lands could legally be transferred to Protestant control. However, for several decades weak emperors had been unable to enforce the "Ecclesiastical Reservation" against Protestant encroachments. 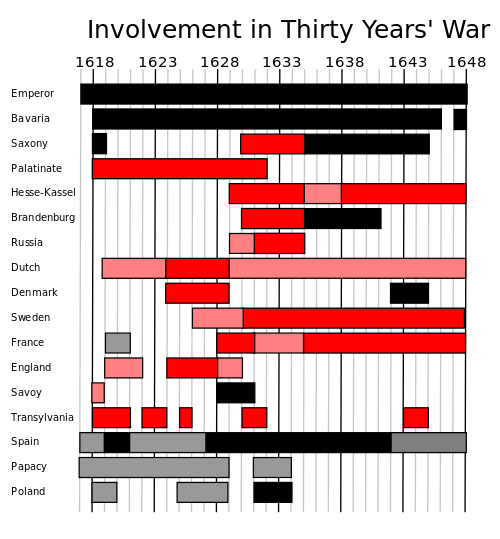 Treaty or Peace of Lübeck ended the Danish intervention in the Thirty Years' War. It was signed in Lübeck on 22 May 1629 by Albrecht von Wallenstein and Christian IV of Denmark, and on 7 June by Ferdinand II, Holy Roman Emperor. The Catholic League was formally included as a party. It restored to Denmark-Norway its pre-war territory at the cost of final disengagement from imperial affairs. Count Jindřich Matyáš Thurn-Valsassina, was a Czech (Bohemian) nobleman, one of leaders of Protestant Bohemian Revolt against Emperor Ferdinand II. He took part in events that led to the Thirty Years War, and after the war he became a military leader and diplomat in Swedish service, who eventually resided in Swedish Estonia. The Bohemian Revolt was an uprising of the Bohemian estates against the rule of the Habsburg dynasty that began the Thirty Years' War. It was caused by both religious and power disputes. The estates were almost entirely Protestant, mostly Utraquist Hussite but there was also a substantial German population that endorsed Lutheranism. The dispute culminated after several battles in the final Battle of White Mountain, where the estates suffered a decisive defeat. This started re-Catholisation of the Czech lands, but also expanded the scope of the Thirty Years' War by drawing Denmark and Sweden into it. The conflict spread to the rest of Europe and devastated vast areas of central Europe, including the Czech lands, which were particularly stricken by its violent atrocities. The Oñate treaty of 29 July 1617 was a secret treaty between the Austrian and Spanish branches of the House of Habsburg. Johann Philipp Kratz von Scharffenstein was a German nobleman and field marshal, who fought during the course of the Thirty Years' War. He served with distinction in forces of both the Catholic League and Holy Roman Empire. His poor relationship with the Imperial generalissimo Albrecht von Wallenstein frustrated his plan of becoming the supreme commander of the League's forces. Embittered by this he defected to Sweden, where he attained the rank of field marshal. He was captured at the Battle of Nördlingen (1634) and executed for treason a year later.